Buddhism is a religion with millions of followers in the United States, including traditionally Buddhist Asian Americans as well as non-Asian converts. The U.S. presents a strikingly new and different environment for Buddhists, leading to a unique history and a continuing process of development as Buddhism and America come to grips with each other. Occasional intersections between Western civilization and the Buddhist world have been occurring for thousands of years. Perhaps the most significant of these began in 334 BC, early in the history of Buddhism, when the Macedonian king Alexander the Great conquered most of Central Asia. The Seleucids and successive kingdoms established an important Hellenistic influence in the area, which interacted with the Buddhism that had been introduced from India to produce Greco-Buddhism. While this trend was very significant in the development of Mahayana Buddhism, it has yet to be established that it made a corresponding impact on Western thought. In the Christian era, Buddhist ideas would periodically filter into Europe via the Middle East. A notable example is the story of Barlaam and Josaphat, folk heroes who were canonized by the Roman Catholic Church and whose story is believed to be an altered account of the life of Siddhartha Gautama, translated from Persian to Arabic to Greek. The first direct encounter between European Christians and Buddhists to be recorded was in 1253 when the king of France sent William of Rubruck as an ambassador to the court of the Mongols. Later, in the 17th century, a group of Mongols practicing Tibetan Buddhism established Kalmykia, the only Buddhist nation in Europe, at the eastern edge of the continent- now a constituent republic of the Russian Federation. Because the above examples produced very little real religious interaction, the European settlers who would come to colonize the Americas had virtually no exposure to Buddhism. This almost complete isolation would last largely undisturbed until the 19th century, when significant numbers of immigrants from East Asia began to arrive in the New World. In the United States, the first immigrants from China entered around 1820, but they began to arrive in large numbers following the California Gold Rush of 1849. The first Buddhist temple in America was built in 1853 in San Francisco by the Sze Yap Company, a Chinese American fraternal society. Another society, the Ning Yeong Company, built a second in 1854; by 1875, there were eight such temples, and by 1900 there were approximately 400 Chinese temples on the west coast of the United States, most of them containing at least some Buddhist elements. These temples were often the subject of suspicion and ignorance by the rest of the population, and were dismissively referred to as joss houses. The Chinese Exclusion Act of 1882 curtailed the growth of the Chinese-American population, but large-scale immigration from Japan began in the late 1880s and from Korea around 1903. In both cases, immigration was at first limited primarily to Hawaii. Populations from other Asian Buddhist countries followed. In each case, the new communities established Buddhist temples and organizations. For instance, the first Japanese temple in the Hawaii was built in 1896 near Paauhau by the Honpa Hongwanji branch of Jodo Shinshu. In 1898, Japanese missionaries and immigrants established a Young Men’s Buddhist Association. The Rev. Soryu Kagahi, was dispatched from Japan to be the first Buddhist missionary in Hawaii. The first Japanese Buddhist temple in the continental U.S. was built in San Francisco in 1899, and the first in Canada was built at the Ishikawa Hotel in Vancouver in 1905. The first Buddhist clergy to take up residence in the continental U.S. were Shuye Sonoda and Kakuryo Nishimjima, missionaries from Japan who arrived in 1899. At about the same time that Asian immigrants were first starting to arrive in America, some American intellectuals were beginning to come to terms with Buddhism, based primarily on information reaching them from British colonial possessions in India and East Asia. The Englishmen William Jones and Charles Wilkins had done pioneering work translating Sanskrit texts into English. The American Transcendentalists and associated persons, in particular Henry David Thoreau took an interest in Hindu and Buddhist philosophy. In 1844, the Dial, a small literary publication edited by Thoreau and Ralph Waldo Emerson, published the first English version of a portion of the Lotus Sutra; it had been translated by Elizabeth Palmer Peabody from a French version recently completed by Eugène Burnouf (this translation is often attributed to Thoreau himself, but this appears to be erroneous). His Indian readings may have influenced his later experiments in simple living: at one point in Walden he wrote: “I realized what the Orientals meant by contemplation and the forsaking of works.” The poet Walt Whitman also admitted to an influence of Indian religion on his writings. The first prominent American to publically convert to Buddhism was Henry Steel Olcott. Olcott, a former U.S. army colonel during the Civil War, had grown increasingly interested in reports of supernatural phenomena that were popular in the late 19th century. In 1875, he, along with Helena Blavatsky and William Quan Judge founded the Theosophical Society, which was dedicated to the study of the occult and was partly influenced by Hindu and Buddhist scriptures. The group’s leaders believed or claimed to believe that they were in contact, via visions and messages, with a secret order of adepts referred to as the “Himalayan Brotherhood” or “the Masters”. In 1879, Olcott and Blavatsky travelled to India and then, in 1880, to Sri Lanka, where they were met enthusiastically by local Buddhists, who saw them as allies against an aggressive Christian missionary movement. On May 25 of that year, Olcott and Blavatsky took the pancasila vows of a lay Buddhist before a monk and a large crowd of onlookers. Although most of the Theosophists appear to have counted themselves as Buddhists, they held idiosyncratic beliefs that separated them from all known Buddhist traditions; only Olcott was enthusiastic about following mainstream Buddhism. He would return to Sri Lanka on two further occasions, where he worked to promote Buddhist education, and also visited Japan and Burma. Olcott authored a Buddhist Catechism, stating his view of the basic tenets of the religion. A series of new publications greatly increased public knowledge of Buddhism in 19th century America. In 1879, Edwin Arnold, an English aristocrat, published The Light of Asia, an epic poem he had written about the life and teachings of the Buddha, expounded with much wealth of local color and not a little felicity of versification. The book became immensely popular in the United States, going through eighty editions and selling more than 500,000 copies. Dr. Paul Carus, a German-American philosopher and theologian, was at work on a more scholarly prose treatment of the same subject. Carus was the director of Open Court Publishing Company, an academic publishing house specializing in philosophy, science, and religion, and editor of The Monist, a journal with a similar focus, both based in Lasalle, Illinois. In 1894, Carus published The Gospel of the Buddha, which was compiled from a variety of Asian texts and, true to its name, presented the Buddha’s story in a form resembling the Christian Gospels. Perhaps the most significant event in the 19th century history of Buddhism in America was the World Parliament of Religions, held in Chicago in 1893. Although most of the delegates to the Parliament were Christians of various denominations, the Buddhist nations of China, Japan, Thailand, and Sri Lanka sent representatives. Buddhist delegates included Soyen Shaku, a Japanese Zen abbott; Zenshiro Noguchi, a Japanese translator; Anagarika Dharmapala, a Sri Lankan associate of H. S. Olcott’s; and Chandradat Chudhadharn, a brother of King Chulalongkorn of Thailand. Paul Carus also attended as an observer. The Parliament provided the first major public forum from which Buddhists could address themselves directly to the Western public; Dharmapala was particularly effective in this role because he spoke fluent English. A few days after the end of the Parliament, in a brief ceremony conducted by Anagarika Dharmapala, Charles T. Strauss, a New York businessman of Jewish descent, became, it is believed, the first person to formally convert to Buddhism on American soil. A few fledgling attempts at establishing a Buddhism for Americans followed. One the most interesting, in fact, had initially appeared prior to the Parliament, met with little fanfare, in 1887: The Buddhist Ray, a Santa Cruz, California-based magazine published and edited by Phillangi Dasa, born Herman Carl (or Carl Herman) Veetering (or Vettering), a recluse about whom little is known. 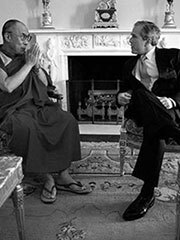 The Ray’s tone was, in the words of Rick Fields, “ironic, light, saucy, self-assured .. one-hundred-percent American Buddhist” (Fields, 1981), which was by all means a novel development in that time and place. It ceased publication in 1894. Elsewhere, six white San Franciscans, working with Japanese Jodo Shinshu missionaries, established the Dharma Sangha of Buddha in 1900 and began publishing a bimonthly magazine, The Light of Dharma. In Illinois, Paul Carus wrote further books about Buddhism and attempted setting portions of Buddhist scripture to Western classical music. In the first half of the 20th century, it would prove to be Buddhist teachers from Japan who played the most active role in disseminating Buddhism to the American public, perhaps because Japan was the most developed and self-confident Buddhist country at the time. In 1905, Soyen Shaku was invited to stay in the United States by a Mr. and Mrs. Russell, a wealthy American couple. He lived for nine months in their home near San Francisco, where he established a small zendo in their home and gave regular zazen lessons, making him the first Zen Buddhist priest to teach in North America. This short sojourn eventually produced an effect on American Buddhism that continues to the present. Shortly after Shaku settled in to his erstwhile home, he was followed by Nyogen Senzaki, a young monk from Shaku’s home temple in Japan. Senzaki briefly worked for the Russell family and then, expressing his desire to stay in America, he was reportedly advised by Shaku to spend seventeen years as an ordinary worker before teaching Buddhism. Thus, it was in 1922 that Senzaki first rented a hall and gave an English talk on a paper by Soyen Shaku; his periodic talks at different locations became known as the “floating zendo”. In 1931, he established a permanent sitting hall in Los Angeles, where he would teach until his death in 1958. Another Zen teacher, Sokatsu Shaku, one of Soyen Shaku’s senior students, arrived in late 1906. Although he stayed only a few years and had limited contact with the English-speaking public, one of his disciples, Shigetsu Sasaki, made a permanent home. Sasaki, better known under his monastic name, Sokei-an, spent a few years wandering the west coast of the United States, at one point living among American Indians near Seattle, and reached New York City in 1916. After completing his training and being ordained in 1928, he returned to New York to teach. In 1931, his small group incorporated as the Buddhist Society of America, later renamed the First Zen Institute of America. By the late 1930s, one of his most active supporters was Ruth Fuller Everett, a British socialite and the mother-in-law of Alan Watts. Shortly before Sokei-an’s death in 1945, he and Everett would wed, at which point she took the name Ruth Fuller Sasaki. In 1914, under the leadership of Koyu Uchida, who succeeded Shuye Sonoda as the head of Jodo Shinshu missionary effort in North America, several Japanese Buddhist congregations formed the Buddhist Mission of North America (BMNA). This organization would later form the basis of the Buddhist Churches of America, currently the largest and most influential ethnic-based Buddhist organization in the U.S. The BMNA focused primarily on social and cultural activities for and ministering to Japanese American communities. In the late 1920s, it first began to develop programs to train English-speaking priests, for the benefit of the growing number of American-born parishoners. Also, in 1927, the Soto sect of Japanese Zen opened its own mission with Zenshuji temple in Los Angeles, although it did not make attempts at the time to attract non-Japanese members. One American who made his own attempt to establish an American Buddhist movement was Dwight Goddard (1861-1939) . Goddard had been a Christian missionary to China, when he first came in contact with Buddhism. In 1928, he spent a year living at a Zen monastery in Japan. In 1934, he founded “the Followers of Buddha, an American Brotherhood”, with the goal of applying the traditional monastic structure of Buddhism more strictly than Senzaki and Sokei-an. The group was largely unsuccessful: no Americans were recruited to join as monks and attempts failed to attract a Chinese Chan (Zen) master to come to the United States. However, Goddard’s efforts as an author and publisher bore considerable fruit. In 1930, he began publishing ZEN: A Buddhist Magazine. In 1932, he collaborated with D. T. Suzuki (see below), on a translation of the Lankavatara Sutra. That same year, he published the first edition of A Buddhist Bible, an anthology of Buddhist scriptures focusing on those used in Chinese and Japanese Zen, which was enormously influential. However, another Japanese person, also an associate of Soyen Shaku’s, had an even greater literary impact. This was D. T. Suzuki. At the World Parliament of Religions in 1893, Paul Carus befriended Soyen Shaku and requested his help in translating and preparing Oriental spiritual literature for publication in the West. Shaku instead recommended Suzuki, then a young scholar and former disciple of his. Starting in 1897, Suzuki worked from Dr. Carus’s home in Illinois; his first projects were translations of the Tao Te Ching and Ashvagosha’s Awakening of Faith in the Mahayana. At the same time, Suzuki began writing his first major book, Outlines of Mahayana Buddhism, which was published in 1907. Suzuki returned to Japan in 1909 and married an American Theosophist and Radcliffe graduate in 1911. Through English-language essays and books, such as Essays in Zen Buddhism (1927), he established himself as the most visible literary expositor of Zen Buddhism, its unofficial goodwill ambassador to Western readers, until his death in 1966. His 1949 book, An Introduction to Zen Buddhism, featured a 30-page introduction by Carl Jung, an emblem of the deepening relationship between Buddhism and major Western thinkers. Some scholars, such as Charles Prebish, have suggested that the social phenomenon of Buddhism in America can be seen to be comprised of three broad types. The oldest and largest of these is “immigrant” or “ethnic Buddhism”, those Buddhist traditions that arrived in America along with immigrants who were already believers and that largely remained with those immigrants and their descendants. The next oldest and arguably the most visible and best-heralded type is referred to as “import Buddhism”, because it came to America largely in response to the demand of interested American converts who sought it out, either by going abroad or by supporting foreign teachers; this is sometimes also called “elite Buddhism” because its practitioners, especially early in the process, tended to come from social elites. The newest trend in Buddhism is “export” or «evangelical Buddhism”, groups which are based in another country and who are actively recruiting members in America from various backgrounds; by far the most successful of these has been Soka Gakkai, which will be discussed below. Immigrant Buddhist congregations in North America come in an extremely wide variety, exactly as wide a variety as exists in the different peoples of Asian Buddhist extraction who have settled there. The New World is home to Chinese Buddhists, Japanese Buddhists, Korean Buddhists, Sri Lankan Buddhists, Vietnamese Buddhists, Thai Buddhists, and Buddhists with family backgrounds in nearly every Buddhist country and region in the world. The passage of the 1965 Immigration Act in the United States greatly increased the number of immigrants arriving from China, Vietnam, and the Theravada-practicing countries of southeast Asia. It is common for Buddhist temples and societies to serve as foci for the social life of an immigrant community, helping to maintain a connection to Old World traditions in a foreign environment. However, as the passing of time produces congregations increasingly dominated by persons born in America, which is especially common among Japanese Buddhists, questions arise about how their religious customs should adapt. The largest and most influential national immigrant Buddhist organization in the United States is the Buddhist Churches of America and the Honpa Hongwanji Mission of Hawaii. The BCA is an affiliate of Japan’s Nishi Hongwanji, a sect of Jōdo Shinshū, which is in turn a form of Pure Land Buddhism. Tracing its roots to the Young Men’s Buddhist Association founded in San Francisco at the end of the 19th century and the Buddhist Mission of North America founded in 1914, it took its current form in 1944. All of the Buddhist Mission’s leadership, along with almost the entire Japanese American population, had been interned during the Second World War. The name Buddhist Churches of America was adopted at Topaz Relocation Center in Utah; the use of the word “church”, which normally implies a Christian house of worship, was significant. After internment ended, some members returned to the West Coast and revitalized churches there, while a number of others moved to the Midwest and built new churches. During the 1960s and 1970s, the BCA was in a growth phase and was very successful at fund-raising. It also began to publish two periodicals, one in Japanese and one in English. However, since 1980, BCA membership has declined markedly. The Honpa Hongwanji Mission of Hawaii has 36 temples throughout the state of Hawaii. The history and organization of the Mission is quite similar to the BCA. It is interesting to note that, while a very large majority of the Buddhist Churches of America’s membership are ethnically Japanese, it does have some members from non-Asian backgrounds. Thus, it can be seen as having some, currently very limited, aspects of an export Buddhist institution. As declining involvement by its ethnic community creates questions about its future, there has been internal discussion as to whether it should devote more attention to attracting the broader public. Another institution with some appeal both to a specific ethnic group as well as to Americans generally is Hsi Lai Temple in Hacienda Heights, California. Hsi Lai is the American headquarters of Fo Guang Shan, an enormously successful modern Buddhist group in Taiwan. Hsi Lai was built in 1988 at a cost of $10 million and was, at the time, the largest Buddhist temple in the Western hemisphere (This claim has now been disputed). Although it continues to cater primarily to Chinese Americans, it also has regular services and outreach programs in English. Hsi Lai was at the center of a bizarre incident in the history of American Buddhism, when a 1996 fund-raising event by Vice President Al Gore provoked a controversy; at the time Hsi Lai was often referred to in the media as simply «the Buddhist temple». Since Henry Steele Olcott travelled to Sri Lanka in 1880, interested Americans have sought out Buddhist teachers from a variety of countries in Asia, many of which have now established their teachings in America. The three most notable trends of this type are Zen, Tibetan Buddhism, and Vipassana, which is an outgrowth of Theravada Buddhism. Because its membership tends strongly to be among educated, white, native English speakers, import Buddhism has come to enjoy a higher level of prominence and prestige than other types of Buddhism in America. Beginning with Soyen Shaku’s invitation to San Francisco and then the ministries of Nyogen Senzaki and Sokei-an, Zen Buddhism was the first import Buddhist trend to put down roots in North America. In the late 1940s and 1950s, writers associated with the Beat Movement, including Gary Snyder, Jack Kerouac, Allen Ginsberg, and Kenneth Rexroth, took a serious interest in Zen, which helped increase its visibility. In 1951, an octagenarian D. T. Suzuki returned to the United States to take a visiting proffessorship at Columbia University, where he began a long series of public lectures on Zen; Kerouac and Ginsberg were among the attendees. In 1956, the Zen Studies Society was formed to support his work. After moving to Cambridge, Massachusetts in 1957, Suzuki was also involved in founding the Cambridge Buddhist Association, which was likely the first Buddhist group in America which was dedicated primarily to practicing zazen meditation. The Zen Studies Society, which had become completely dormant when D. T. Suzuki left Columbia, would be revived in 1965 by Eido Tai Shimano, a New York–based Rinzai Zen teacher. One of the most influential figures in 20th century American Zen was Shunryu Suzuki. After serving as a temple priest in Japan, Suzuki requested to be sent to America, and, in 1959, at the age of 54, he travelled to San Francisco to manage Sokoji, the city’s Soto Sect mission. When he arrived, his congregation consisted almost exclusively of older Japanese people, although his predecessors had begun to make some efforts at a broader outreach. Suzuki himself proved to be more comfortable teaching Americans than Japanese. He quickly attracted a group which met for regular zazen sittings and lectures in English. The group incorporated as the San Francisco Zen Center and, in 1966, purchased a tract of land near Los Padres National Forest to began building Tassajara Zen Mountain Center, described as the first Buddhist training monastery located outside of Asia. In 1969, Suzuki left Sokoji when the Zen Center started its own new temple in San Francisco, operating largely independently of the Soto Sect in Japan. In 1970, Zen Mind, Beginner’s Mind, an edited collection of talks given by Suzuki, was published and became one of the most popular brief introductions to Zen practice. The San Francisco Zen Center remains one of America’s largest and most influential Buddhist groups and is now part of a network of related centers. Sanbo Kyodan Zen is a contemporary Japanese Zen lineage which had an impact in the West disproportionate to its size Japan. It is rooted in the reformist teachings of Harada Daiun (1871-1961) and his disciple Yasutani Hakuun (1885-1971), who argued that the existing Zen institutions of Japan, the Soto and Rinzai sects, had become complacent and, with few exceptions, were unable to teach real Dharma. Harada had studied with both Soto and Rinzai teachers and Yasutani founded Sanbo Kyodan in 1954 to preserve what he saw as the vital core of teachings from both schools. Sanbo Kyodan’s first American member was Philip Kapleau, who first travelled to Japan in 1945 as a court reporter for the war crimes trials. In 1947, Kapleau visited D. T. Suzuki at Engaku-ji in Japan and in the early 1950s, he was a frequent attendee of Suzuki’s Columbia lectures. In 1953, he returned to Japan, where he met with Nakagawa Soen, a protégé of Nyogen Senzaki. At Nakagawa’s recommendation, he began to study with Harada and later with Yasutani, whose disciple he became. In 1965, he published a book, The Three Pillars of Zen, which recorded a set of talks by Yasutani outlining his approach to practice, along with transcripts of dokusan interviews and some additional texts. The book quickly became popular in America and Europe, contributing to the prominence of the Sanbo Kyodan approach to Zen. Later in 1965, Kapleau returned to America and, in 1966, established the Rochester Zen Center in Rochester, New York, making him the first American-born Zen priest to found a training temple. In 1967, Kapleau had a falling out with Yasutani over some of Kapleau’s moves to Americanize the style of his temple, after which it became independent of Sanbo Kyodan. The Rochester Zen Center is now part of a network of related centers in the United States, Canada, Europe, Mexico, and New Zealand, referred to collectively as the Cloud Water Sangha. One of Kapleau’s most notable early disciples was Toni Packer, who herself left Rochester in 1981 to found a nonsectarian meditation center, not specifically Buddhist or Zen. Robert Aitken is another important American member of Sanbo Kyodan. He was first introduced to Zen as a prisoner in Japan during the Second World War. After returning to the United States, he began studying with Nyogen Senzaki in Los Angeles in the early 1950s. In 1959, while still a Zen student himself, he founded the Diamond Sangha, a zendo in Honolulu, Hawaii. Three years later, the Diamond Sangha hosted the first U.S. visit by Yasutani Hakuun, who would visit various locations in the U.S. six more times before 1969. Aitken travelled frequently to Japan and became a disciple of Yamada Koun, Yasutani’s successor as head of the Sanbo Kyodan. Aitken became a dharma heir of Yamada’s, authored more than ten books, and developed the Diamond Sangha into an international network with temples in the United States, Argentina, Germany, and Australia. In 1995, he and his organization split with Sanbo Kyodan in response to reorganization of the latter following Yamada’s death. The Pacfic Zen Institute led by John Tarrant, Aitken’s first Dharma successor continues as an independent Zen line. As does the Boundless Way Zen network led by Tarrant’s successor James Ishmael Ford who attempts to bring the Harada-Yasutani koan curriculm into an organization that maintains close links with the Soto Zen Buddhist Association and, interestingly, Unitarian Universalism. Another influential Japanese Zen teacher was Taizan Maezumi, who arrived as a young priest to serve at Zenshuji, the North American Soto sect headquarters in Los Angeles, in 1956. Like Shunryu Suzuki, he showed considerable interest in teaching Zen to Americans of various backgrounds and, by the mid-1960s, had formed a regular zazen group. In 1967, he and his supporters founded the Zen Center of Los Angeles. He was later instrumental in establishing the Kuroda Institute and the Soto Zen Buddhist Association, the latter an organization of American teachers with ties to the Soto tradition. In addition to his membership in Soto, Maezumi was also recognized as an heir by a Rinzai teacher and by Yasutani Hakuun of the Sanbo Kyodan. Maezumi, in turn, had several American dharma heirs who have become prominent, such as Bernie Glassman, John Daido Loori, Charlotte Joko Beck, and Dennis Genpo Merzel. His successors and their network of centers have organized as the White Plum Asanga. Not all the successful Zen teachers in the United States have been from Japanese traditions. There have also been teachers of Chinese Zen (also known as Chan), Korean Zen (or Seon), and Vietnamese Zen (or Thien). The first Chinese Buddhist priest to teach Westerners in America was Hsuan Hua, a disciple of the preeminent 20th century Chan master, Hsu Yun. In 1962, Hsuan Hua moved to San Francisco’s Chinatown, where, in addition to Zen, he taught Chinese Pure Land, Tiantai, Vinaya, and Vajrayana Buddhism. Initially, his students were mostly ethnic Chinese, but he eventually attracted a range of followers. In 1970, Hsuan Hua founded Gold Mountain Monastery in San Francisco and in 1976 he established a retreat center, the City Of Ten Thousand Buddhas, on a 237 acre (959,000 m²) property near Ukiah, California. These monasteries are noted for their close adherence to the vinaya, the austere traditional Buddhist monastic code. Hsuan Hua also founded the Buddhist Text Translation Society, which works on the translation of scriptures into English. Another Chinese Zen teacher with a Western following is Sheng-yen, a master trained in both the Caodong and Linji schools (equivalent to the Japanese Soto and Rinzai, respectively). He first visited the United States in 1978 under the sponsorship of the Buddhist Association of the United States, an organization of Chinese American Buddhists. In 1980, he founded the Ch’an Mediation Society in Queens, New York. In 1985, he founded the Chung-hwa Institute of Buddhist Studies in Taiwan, which now sponsors a variety of Chinese Zen activities in the United States. The most prominent Korean Zen teacher in America was Seung Sahn. Seung Sahn had been the abbot of a temple in Seoul and had also lived in Hong Kong and Japan when, in 1972, not speaking any English, he decided to move to America. On the flight to Los Angeles, a Korean American passenger offered him a job at a laundry in Providence, Rhode Island, the city which was to become the headquarters of Seung Sahn’s Kwan Um School of Zen. Shortly after arriving in Providence, he attracted a group of America students and founded the Providence Zen Center. The affiliated Kwan Um School now has more than 100 Zen centers on six continents. Another notable Korean Zen teacher in America is Samu Sunim, who moved to America in 1968 and founded Toronto’s Zen Buddhist Temple in 1971. He is now the head of the Buddhist Society for Compassionate Wisdom, which has temples in Ann Arbor, Chicago, and Mexico City. Two notable Vietnamese Zen teachers have been influential in America: Thich Thien-An and Thich Nhat Hanh. Thich Thien-An came to America in 1966 as a visiting professor at UCLA and taught traditional Thien meditation. Thich Nhat Hanh was a monk in Vietnam during the Vietnam War, during which he was a peace activist. In response to these activities, he was nominated for the Nobel Peace Prize in 1967 by Martin Luther King, Jr. .In 1966, he left Vietnam in exile and now resides at Plum Village, a monastery in France. He has written more than one hundred books about Buddhism, which have made him one of the very few most prominent Buddhist authors among the general readership in the West. In his books and talks, Thich Nhat Hanh emphasizes mindfulness (sati) as the most important practice in daily life. Perhaps the most widely visible Buddhist teacher in the world is Tenzin Gyatso, the current Dalai Lama, who first visited the United States in 1979. As the exiled political leader of Tibet, he has become a popular cause célèbre. His early life was depicted in glowing terms in Hollywood films such as Kundun and Seven Years in Tibet. He has attracted celebrity religious followers such as Richard Gere and Adam Yauch. The first Western-born Tibetan Buddhist monk was Robert A. F. Thurman, now a noted academic supporter of the Dalai Lama. The Dalai Lama maintains a North American headquarters at Namgyal Monastery in Ithaca, New York. The best-known Tibetan Buddhist lama to live in the United States was Chögyam Trungpa. Trungpa, part of the Kagyu school of Tibetan Buddhism, moved to England in 1963, founded a temple in Scotland, and then relocated to Barnet, Vermont, and Boulder, Colorado in 1970. He established a series of what he named Dharmadhatu meditation centers, which were eventually organized under a national umbrella group called Vajradhatu (later to become Shambhala International). The methods and techniques he developed for teaching Westerners he termed Shambhala Training. Following Trungpa’s death, his followers built the Great Stupa of Dharmakaya, a traditional reliquary monument, near Red Feather Lakes, Colorado. Consecrated in 2001, it is the largest stupa in the United States. The first Tibetan Buddhist lama to come to the United States was Geshe Ngawang Wangyal, a Kalmyk-Mongolian of the Gelug lineage, who came to the United States in 1955 and founded the «Lamaist Buddhist Monastery of America» in New Jersey in 1958. Among his students were the future western scholars Robert Thurman, Jeffrey Hopkins and Alexander Berzin. Other early arrivals included Deshung Rinpoche, a Sakya lama who settled in Seattle, WA, in 1960, and Tarthang Tulku Rinpoche, the first Nyingma teacher in America, who arrived in the U.S. in 1968 and established the «Tibetan Nyingma Meditation Center» in Berkeley, CA in 1969. In the 21st century, the Nyingma lineage is increasingly represented in the West, by both Western and Tibetan teachers. Lama Surya Das is a Western-born teacher carrying on the great rimé, or non-sectarian, branch of Tibetan Buddhism. H.E. Chagdud Tulku Rinpoche, before his death in 2002, founded centers in Seattle and Brazil. Khandro Rinpoche is a modern female Tibetan teacher who has a strong presence in America. Jetsunma Ahkon Lhamo, the first Western woman to be recognized and enthroned as a Tulku, has also established Nyingma centers in Sedona, AZ and Poolesville, MD. The Gelug tradition is most strongly represented in America by the Foundation for the Preservation of the Mahayana Tradition (FPMT), founded by Lama Thubten Yeshe and Lama Zopa. Another prominent Gelugpa teacher is Geshe Michael Roach, the first American to be awarded a Geshe degree, who has established centers in New York, NY, and at Diamond Mountain in Arizona. Also quite active in the United States is the self-described «New Kadampa Tradition» established by Geshe Kelsang Gyatso. A schismatic offshoot of the Gelug school founded in the 1990s in the UK, the NKT has been very successful promoting what it describes as a presentation of Buddhism tailored to western needs. Aside from Geshe Kelsang Gyatso himself, all of the adherents are westerners. Vipassana, also referred to by the rough translation “insight meditation” is an ancient meditative practice described in the Pali Canon of the Theravada school of Buddhism, and in similar scriptures of other schools. Vipassana also refers to a distinct movement which was begun in the 20th century by reformers such as Mahāsi Sayādaw, a Burmese monk. Mahāsi Sayādaw was a Theravada bhikkhu and Vipassana is rooted in the Theravada teachings, but its goal is to simplify ritual and other peripheral activities in order to make meditative practice more effective and available both to monks and to laypeople. This openness to lay involvement is an important development in Theravada, which has sometimes appeared to focus exclusively on monasticism. In 1965, monks from Sri Lanka established the Washington Buddhist Vihara in Washington, D.C., the first Theravada monastic community in the United States. The Vihara was fairly accessible to English-speakers, and naturally vipassana meditation was part of it activities. However, the direct influence of the Vipassana movement would not reach the U.S. until a group of Americans returned there in the early 1970s after studying with Vipassana master in Asia. Joseph Goldstein, after journeying to Southeast Asia with the Peace Corps, had lived in Bodhgaya, where he was a student of Anagarika Munindra, the head monk of Mahabodhi Temple and himself a student of Māhāsai Sayādaw’s. Jack Kornfield had also been in the Peace Corps in Southeast Asia, after which he studied with Ajahn Chah, perhaps the most influential figure in 20th century Thai Buddhism. Sharon Salzberg went to India in 1971 as a spiritual seeker and studied with Dipa Ma, a former Calcutta housewife trained in vipassana by Māhāsai Sayādaw. Goldstein and Kornfield met in 1974 while teaching at the Naropa Institute in Colorado. The next year, Goldstein, Kornfield, and Salzberg, who had very recently returned from Calcutta, along with Jacqueline Schwarz, founded the Insight Meditation Society on an 80 acre (324,000 m²) property near Barre, Massachusetts. IMS became the central Vipassana instituation in America, hosting visits by Māhāsi Sayādaw, Munindra, Ajahn Chah, and Dipa Ma. In 1981, Kornfield moved to California, where he founded another Vipassana center, Spirit Rock Meditation Center, in Marin County. In 1985, Larry Rosenberg founded the Cambridge Insight Meditation Center in Cambridge, Massachusetts. Another important Vipassana center is the Vipassana Metta Foundation, located on Maui. In 1989, the Insight Meditation Center established the Barre Center for Buddhist Studies near the IMS headquarters, with the goal of promoting scholarly investigation of Buddhism from various perspectives. It director is Mu Seong, a former Korean Zen monk. S. N. Goenka is an Indian-born meditation teacher who can also be considered part of the Vipassana movement. His teacher, Sayagyi U Ba Khin of Burma, was a contemporary of Māhāsi Sayādaw’s, and taught a style of Buddhism with similar emphases on simplicity and accessibility to laypeople. Goenka has established a method of instruction which has proven very popular in Asia and throughout the world. In 1981, he established the Vipassana Research Institute based in Igatpuri, India. He and his students have built several active centers in North America. Although ethnic-based institutions, such as Hsi Lai Temple and the Buddhist Churches of America, show some evangelical tendencies, there is only one Buddhist group in North America which has focused on recruiting converts from among the general public and been successful: Soka Gakkai, a Japan-based society which promotes Nichiren Buddhism. Soka Gakkai, which literally means “Establishing Value Education Society”, was founded in Japan in 1930 as a fraternal auxiliary to Nichiren Shoshu, the largest sect of Nichiren Buddhism. It was perhaps the most successful of Japan’s new religious movements, which enjoyed tremendous growth after the end of the Second World War. During the occupation of Japan, some American soldiers became aware of it, and it was the Japanese wives of veterans who became the first active Soka Gakkai members in the West. A U.S. branch was formally organized on October 13, 1960. Its Korean-Japanese leader took the name George M. Williams to emphasize his commitment to reaching the English-speaking public. Soka Gakkai expanded rapidly in the U.S. through an aggressive recruitment technique called shakubuku. One of the results of this outreach is that Soka Gakkai has been much more effective than any other group at attracting non-Asian minority converts, chiefly black and Latino, to Buddhism. It has also been successful in attracting the support of celebrities, such as Tina Turner, Herbie Hancock, Orlando Bloom, and Courtney Love. Soka Gakkai has no priests of its own and was originally part of Nichiren Shoshu, a formal religious sect in Japan. In fact, its United States branch was originally named Nichiren Shoshu America (NSA). However, in 1991 Soka Gakkai split from Nichiren Shoshu and became a separate organization; at that time, the U.S. branch changed its name to Soka Gakkai International — United States of America (SGI-USA). Nichiren Shoshu proper maintains six temples of its own in the U.S. and another Nichiren group exists which is primarily the domain of ethnic Japanese. The main religious practice of Soka Gakkai members, like other Nichiren Buddhists, is chanting the mantra Nam Myōhō Renge Kyō and sections of the Lotus Sutra. Unlike import Buddhist trends such as Zen, Vipassana, and Tibetan Buddhism, Soka Gakkai does not teach meditative techniques other than chanting. For various reasons, it is not easy to arrive at an accurate idea of the number of Buddhists in the United States. The simplest reason is that it is not at all clear how to define who is and who is not a Buddhist. The easiest and most intuitive definition is one based on self-description, but this has its pitfalls. Because Buddhism exists as a cultural concept in American society, there may be individuals who self-describe as Buddhists but have essentially no knowledge of or commitment to Buddhism as a religion or practice; on the other hand, others may be deeply involved in meditation and committed to the Buddhadharma, but may refuse the label “Buddhist”. Despite these difficulties, several scholars have investigated this question. Most studies have indicated a Buddhist population in the United States of between 1 and 4 million. The U.S. State Department’s International Religious Freedom Report for 2004 indicates that 1.0% of the U.S. population is Buddhist, which would mean a total of 3,000,000 Buddhists (give or take about 100,000). Other estimates, perhaps relying on a greater degree of intuition, are larger: in the 1990s, Robert A. F. Thurman stated his opinion that there were 5 to 6 million Buddhists in America, and others might speculate there are more. Whatever the total number, it appears that roughly 75 to 80 percent of Buddhists in the U.S. are of Asian descent and inherited Buddhism as a family tradition; the remaining 20 to 25 percent are American converts. Discussion about Buddhism in America has sometimes focused on the issue of the visible ethnic divide separating ethnic Buddhist congregations from import Buddhist groups. Although many Zen and Tibetan Buddhist temples were founded by Asians, they now tend to attract very few Asian-American members. With the important exception of Soka Gakkai, almost all active Buddhist groups in America can be readily classed as either ethnic or import Buddhism based on the demographics of their membership. There is often very limited contact between these Buddhists of different ethnic groups. This divide can be disturbing in view of the historical necessity of relying on Asian peoples to transmit Buddhism, and in light of ongoing and complex tensions surrounding ethnicity and immigration in America. Some Asian-American Buddhists feel that their non-Asian counterparts ignore the many contributions of their ethnic communities toward the development of American Buddhism. However, the cultural divide should not necessarily be seen as pernicious. It is often argued that the differences between Buddhist groups arise benignly from the differing needs and interests of those involved. Convert Buddhists tend to be interested in meditation and philosophy, in some cases eschewing the trappings of religiosity altogether. On the other hand, for immigrants and their descendants, preserving tradition and maintaining a social framework assume a much greater relative importance, making their approach to religion naturally more conservative. Further, Kenneth K. Tanaka suggests, based on a survey of Asian-American Buddhists in San Francisco, that “many Asian-American Buddhists view non-Asian Buddhism as still in a formative, experimental stage” and yet they believe that it “could eventually mature into a religious expression of exceptional quality”. Additional questions come from the demographics within import Buddhism. Researchers and casual observers alike report that the vast majority of American converts practicing at Buddhist centers are white people with Christian or Jewish backgrounds. Only Soka Gakkai has attracted significant numbers of black or Latino members. A variety of ideas have been broached regarding the nature, causes, and significance of this racial uniformity. A key question is the degree of importance ascribed to discrimination, which is suggested to be mostly unconscious, on the part of white converts toward potential minority converts. To some extent, the racial divide is indicative of a class divide, because convert Buddhists tend strongly to be drawn from the more educated segments of society. Among the African American Buddhists who have commented on the dynamics of the racial divide in convert Buddhism are Jan Willis and Charles R. Johnson. An important trend that has developed in Buddhism in the West is socially engaged Buddhism. While some critics have asserted that the term is redundant, as it is mistaken to believe that Buddhism in the past has not affected and been affected by the surrounding society, others have suggested that Buddhism is sometimes seen as too quietistic and passive toward public life. This is particularly true in the West, where almost all converts to Buddhism come to it outside of an existing family or community tradition. Engaged Buddhism is an attempt to apply Buddhist values to larger social problems, including war and environmental concerns. The term engaged Buddhism was coined by Thich Nhat Hanh, who developed the idea during his years as a peace activist in Vietnam. The most notable engaged Buddhist organization is the Buddhist Peace Fellowship, which was founded in 1978 by Robert Aitken, Anne Aitken, Nelson Foster, and others and received early assistance from Gary Snyder, Jack Kornfield, and Joanna Macy. Another engaged Buddhist group is the Zen Peacemaker Order, which was founded in 1996 by Bernie Glassman and Sandra Jishu Holmes. A variety of Buddhist groups have established institutions of higher learning in America. The first four-year Buddhist college in the U.S. was the Naropa Institute (now Naropa University), which was founded in 1974 by Chögyam Trungpa. It has enjoyed consistent involvement both from convert Buddhists and counterculture personalities, such as Allen Ginsberg, who christened the Institute’s poetry department the “Jack Kerouac School of Disembodied Poetics”. Naropa is currently fully accredited and offers degrees in some subjects not directly related to Buddhism. Another Buddhist university is the University of the West, which is affiliated with Hsi Lai Temple and was, until recently called Hsi Lai University. Soka Gakkai also sponsors two branches of Soka University, which is based in Japan. The City of Ten Thousand Buddhas is the site of Dharma Realm Buddhist University, a four-year college teaching courses primarily related to Buddhism but including some general-interest subjects. The Buddhist Churches of America runs its Institute of Buddhist Studies in Berkeley, California, which offers a degree in Buddhist Studies but is primarily a seminary. The first Buddhist high school in the United States, Pacific Buddhist Academy, opened in Honolulu in 2003. It is affiliated with the Hompa Hongwanji Jodo Shinshu mission, which had already run an elementary and middle school. Fields, Rick (1981, 1992). How the Swans Came to the Lake: A Narrative History of Buddhism in America. London: Shambhala Publications. ISBN 0-87773-583-2. Lehnert, Tomek (1997). Rogues in Robes. Nevada City, California: Blue Dolphin Publishing. ISBN 1-57733-026-9. Prebish, Charles (2003). Buddhism — the American Experience. Journal of Buddhist Ethics Online Books, Inc. ISBN 0-9747055-0-0.